Half of all peace deals fail within five years. This is how you make them work. 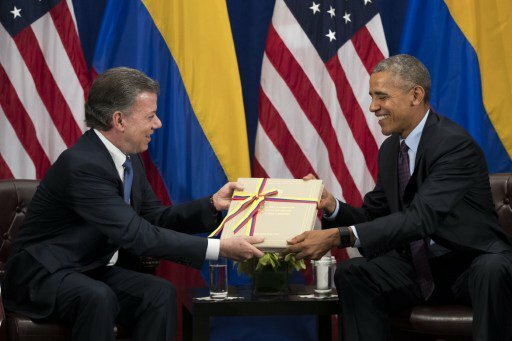 President of Colombia Juan Manuel Santos gives ex-U.S. President Barack Obama a copy of the Colombian peace agreement, September 21, 2016. Credit: Flickr/Agencia de Noticias Andes. Some rights reserved. Violent conflict is on the rise. According to the Global Peace Index 2017 published last month, the last decade has seen the highest decline in world peace since the Cold War. The World Bank has also noted that two billion people live in ‘fragile states.’ That’s more than a fifth of the world’s population. By contrast, only one comprehensive, major peace agreement was signed in 2016, between the Colombian government and FARC rebels. This was an inspiring example of diplomacy, compromise and determination in action, but less than a year later, some commentators are already casting doubt on whether the deal has sufficient support in Colombia to survive. Sadly, history shows that half of all peace agreements collapse very quickly, roughly within five years of signing. Why is this, and how can countries like Colombia avoid the same fate? The problem with many peace deals is that they seldom if ever address the underlying causes of the conflict. In reality, every peace agreement is no more than a ceasefire, designed to stop the fighting for now. Important though such agreements are, what really matters is what happens afterwards. Peace deals also often result from external pressures rather than from a genuine coming together of opponents whose own analysis tells them that now is the time to seek a non-military solution. Such externally brokered peace deals can be particularly tenuous. A big risk to peace also comes from third-party ‘spoilers’—leaders or parties who feel that the emerging peace threatens their interests or excludes them. Meanwhile, geopolitical factors such as changes in policy by major players like the USA can shift the circumstances and render the agreement no longer valid. Current discussions around whether the Northern Ireland Peace Agreement will be undermined by Brexit or the recent UK general election is one example of how susceptible peace can be to apparently unconnected events. The peace that was brought by the 1998 Good Friday Agreement is now widely accepted, but as the Irish scholar Eunan O’Halpin has said, there are still unresolved tensions and bitterness. This is why peace deals must, first and foremost, be won and sustained locally. Among countries where agreements did not hold is South Sudan, where dissatisfaction among elites over access to political and economic power led to the resurgence of rivalries and violence soon after the country’s independence in 2011. And in Rwanda, spoilers played a part when some Hutu leaders rejected the Arusha Peace Accords in 1994, less than two years after signing, fearing that returning Tutsi rebels would have too much power, and contributing to the genocide that killed hundreds of thousands of people in less than three months. In all of these cases, the peace agreement did not resolve the underlying political and economic grievances that pre-dated it, resulting in renewed violence. What could have been done differently? Agreements that have stood the test of time thus far include South Africa’s National Peace Accord (NPA) of 1991, which supported the peaceful transition from apartheid rule and brought an end to the long-term conflict between the ANC and the state. While not perfect, this process created structures that helped to contain violence, address injustices and create mechanisms for peace, including local conflict monitoring and mediation. This was partly achieved by establishing local and regional peace committees, which brought together religious and political leaders, business people, security forces, and others. And, while encouraged by outsiders, the accord was the result of political calculations made by the South African parties themselves. Stronger peace deals like this one are developed over a period of years. They are hard to achieve, and usually have mechanisms built in to monitor the peace by interested international parties, helping to ensure that the process delivers real peace dividends and continues to evolve. Examples include Nepal, which last year celebrated a decade since the signing of the Comprehensive Peace Agreement. It has taken a long time and much discussion to deliver key elements of this agreement, particularly the much disputed new constitution that sets out a new, federal state. Much remains to be done, but so far the fact that the process has not been rushed is probably an advantage. Or take Lebanon, where the Taif Agreement ending the long-lasting sectarian conflict was signed in 1989 and has held ever since. A crucial element in this case was the inclusion of a mechanism to ensure that all sectarian groups are represented in governance—essentially reserving parliamentary seats and ministerial positions for particular groups. Nevertheless, no peace agreement is foolproof, and the Lebanese and Nepalese still have to manage their peace every day. In Nepal, the complex new constitution is yet to be fully implemented. And in Lebanon, the political system will no doubt need to evolve to be able to deal with new tensions and realities such as changes in demography and regional conflict dynamics—for example, the refugee crisis emerging from the war in neighbouring Syria, which is putting pressures on the Lebanese population and public services. The contexts vary, but the need to continue the work of peacebuilding after a deal is signed is universal. In Colombia today, the challenge is to ensure that every party fulfils their commitments and that all Colombians see advantages in the peace process, and get behind it. For a peace deal to last, it must be achieved and maintained by people right across society. These efforts must continue long after the ink on a peace agreement has dried.